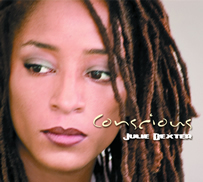 Julie Dexter does that Neo Soul sound like it should be done!!! She has shared the stage with the likes of; Jill Scott, Bilal, Amel Larrieux, Donnie, Omar Loose Ends, Jaguar Wright, Rachelle Ferrell, Ledisi, Frank McCoomb, Eric Roberson, Raheem DeVaughn. Some of my favorite artists!!! Dat gurl badda dan a mopho! inhale, hold it, pass it!